I recently purchased the Wink Lookout security system and we've used it enough to warrant a review. The system has been installed for 4 months. I was in search of a system that was cost-effective, simple to use, and able to work with some of our existing security devices, and one with no monthly fees. I didn't set out to use Wink Lookout simply because we already used the Wink Hub 2. It seemed like a natural choice but I still did some due diligence. One of the systems I really liked was Simplisafe, it met my needs from the features, devices available to aesthetics. It had the option for professional monitoring but the biggest issue I had was that in order to use the smart home integration, you have no choice but to pay a monthly fee. After taking everything into consideration, I decided on Wink Lookout as part of our smart home security system. There are bundles available for purchase that includes the Wink Hub 2. Since we already had the hub, I bought the products ala carte direct from the wink.com. I purchased 3 door and window sensors, 1 siren and chime, and 1 motion sensor. The installation went smoothly. For the sensors, you simply remove the tab and the hub will recognize a new device. 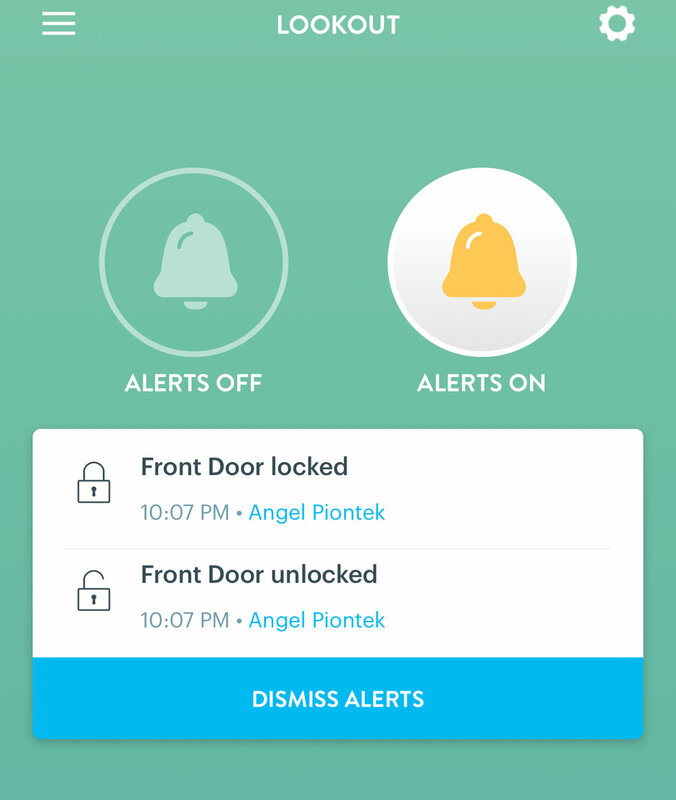 Due to the installation of multiple sensors, it's important that you install and label them on the app one at a time otherwise you will lose track as to which door or window you've installed the sensor. It isn't difficult to figure out but save yourself the trouble by being organized from the beginning. We placed them on two exterior doors on the main level and one in the basement. The hub immediately recognized the sensors and I had no trouble pairing them. The motion sensor with mounting magnet was easy to install and point to your desired spot. If you're looking for a DIY system that doesn't require any monthly fees or contracts, this is a good option. The Lookout system allows you to add compatible devices such as a smart lock and Wink-compatible cameras as part of your security system. The Wink hub allows you to set "robots" to effectively arm and disarm the system based on parameters you set. The functionality is similar to IFTTT. If you live in a small apartment or condo, this may be enough to keep tabs on your home if paired with a camera. It's reasonably priced at $165 for 5 devices. The system has worked perfectly since installation, the sensors and siren worked well at detecting activity and sending alerts. Some people might find that not having the monitoring option to be a negative but for someone like me who is looking to self-monitor, it's a good solution. Lookout lets you manage notifications and view activity. That's it. It's quite rudimentary and only allows you to turn notifications off and on for devices as well as system-wide alerts. There's no camera so in addition to this system so we also use the Canary all-in-one as part of our security system. Stay tuned for a Canary review but I'm mentioning it here because it's part of the automation I've created for our home. The first thing you should do is manage notifications on your devices. You will receive every single notification when activity is detected on any of the devices added to Lookout and it will drive you crazy. Let's get to the automation, as I mentioned earlier, Wink uses what they call "robots" to automate based on your location, time of day, or a trigger by a product or sensor. The robots are not limited to security products, they can be used for any devices paired with the Wink hub. Since we're talking about security, this isn't a complete list but here's how I automated some of my security devices. Robot for motion: Motion detected for a specified block of time (at night) will turn on the basement siren and notify me. Robot for leaving home: Motion & doors are enabled and Canary is set to "Away" when I leave home. Robot for coming home: Motion and doors are disabled and Canary is set to"Home" when I arrive home. Robot for family members visiting: When smart lock is unlocked, Canary is set to "Home" and motion is disabled. The siren comes with the option to sound a chime instead of the siren. You can set a robot to sound a chime (doorbell sound is available) when your garage or front door opens as an alert that someone else is home. The robots are easily deleted when you no longer have a need for it. You can also easily disable a robot temporarily. Verdict: The Wink Lookout security system offers good value but you have some work to do with setting your own automation.